With 6 other teams in attendance one would think there would be more to be said. I agree, Bill. I had fun, and appreciate being allowed to race with you guys. The racing was good, the food was better, and I didn't damage your car too much. Apparently nobody else had any fun, or wants to admit it. Great day of racing with another well run event. I will race for Montgomery Inn barbecue sauce pulled pork sandwiches anytime! I always have fun racing at Tom Thumb! I would like to thank the McMasters for a great job (as always). Tri-State didn't get the finish we had hoped for. That pesky motor change hurt us but we still had an awesome car thanks to Scott H. and Scott B. We turned a lot of laps, gained a lot of experience, and had a good time! Also a big thank you to Bill Fulmer for all his great pics and hard work!! Was incredibly glad for the opportunity to race with Josh and Jessica. Believe me, I had a rough opening stint because I hadn't quite made friends with the car in practice and we ended up having to fight the whole race long to make up for that initial bad spot. Special thanks to Steve Koepp for the ride down, Mike McMasters for talking my team into taking on "some Flexi guy from up north", Jessica McMasters for plenty of great stints to pile on the laps, and Josh Crutchfield for building a great car to take the beating of that race and then letting me take it home. I'll be back next year guys! The hospitality of the McMasters is legendary...ask anyone who has ever raced at TT. Also thanks for the great food! My first enduro and great fun with Nelson and Raisin. A very, very sweet DK chassis bought off Slotblog which I got a little less than 3 weeks before the race. It had not turned a wheel until the Friday before the race. A little weight added here and there and it was a rocket. Thanks DK. I can attest to the issue of laps not counting with the Red Fox guide unless there are long braids on it. Raisin lost about 40 laps in the last stint with no laps counting. We probably lost some before then as well. Fortunately we had a large enough lead over third place that it didn't end up costing us. I'm ready for the next one! I can attest to the issue of laps not counting with the Red Fox guide unless there are long braids on it. It was mentioned to me that one of the other cars in the race, missed laps also, without a Red Fox guide, when it had a bad braid. That would have been our car. An early hit tweaked the nose so that it was "carrying" the guide and arcing badly. We were changing braids almost every heat. One heat we elected to "double-stint" the braids because we had really closed in on 3rd from 4th and ended up losing a bunch of laps that Jessica turned. Oops on our part! double stint? What is that? It's a road racing/endurance racing term. Justin is referring to how many heats he left the braid in for. A single heat would be a "single stint", so two heats would be a "double stint". So many to thank for the weekend.....The Tom Thumb staff did their usual magic in hosting an event. Thank you Diana for traveling all the way from Texas, Thank you Nelson for putting up with me all weekend, and of course a big thank you to all the other participants. I am pretty sure everyone had as good a time as I did. I think we learned that the 7r 7r 7r 7r controversy was much ado about nothing as ours was very fast and ran the entire 6 hours without slowing down. In fact I was told that we set fast lap of the race in the final heat. Proud to drive an American car, from an American manufacturer, assembled by American workers. I own a car from each of the big 3, I have a Ford, a Mercury, and a Lincoln. Except it was a GVP built GVP chassis. Not a DK. No one has figured out that main rail system yet. GVP, I believe if you re-read Steve's post and substitute their for there he was talking about the Big 3 chassis "workin" which is a DK. Raisin did the 4.70 in the 16th heat and the DK was screaming. I see that now, Thought he was talking about the winning team he was on. 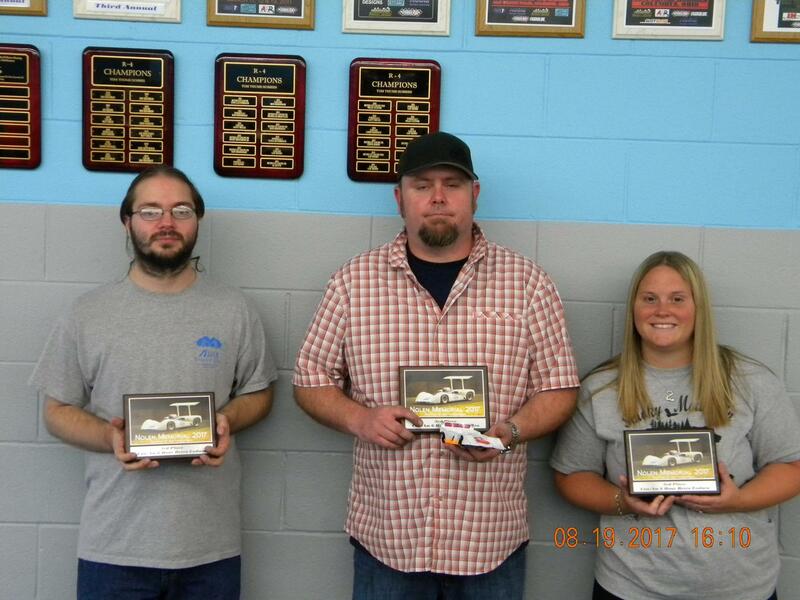 The winning team for the last two years have used GVP built chassis using R-Geo products. Dennis builds very good chassis and you did him proud by finishing 2nd only 138.6 laps down from the winning team. We were 75 down going into the last 2 heats. The laps not counting bit us. We still wouldn't have won but the lap count would have been different. I think you'll agree that the quality of the drivers is a tad bit different between the two teams, eh? I wasn't equal to, or close to it, to any of the drivers on RGeo.